Chicago’s historic Merchandise Mart (rebranded as theMART), a massive art deco design center on the bend of the Chicago River, will play host to a 2.6-acre art installation come fall of 2018. At a press conference this Sunday, Mayor Rahm Emanuel, city cultural officials, and representatives of building owners Vornado Realty Trust’s Chicago branch announced a plan to convert the front wall of The Mart into a canvas for large-scale, projected art. 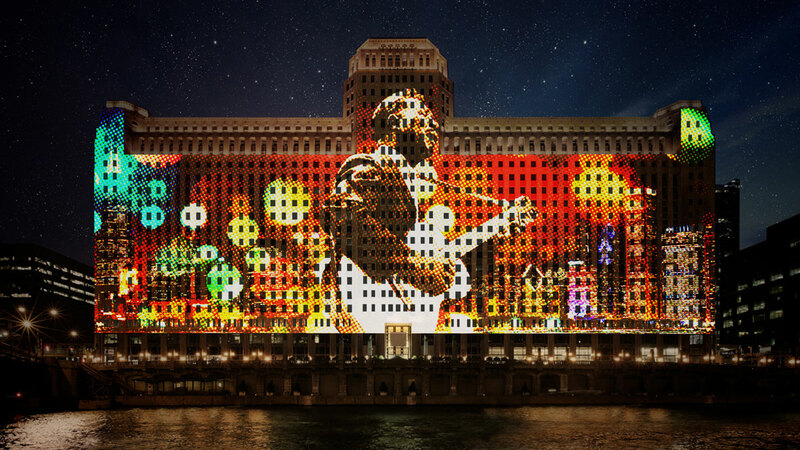 “Art on theMART” will paint the river-facing wall of the Mart with high-resolution images and videos, including indie works, through an open-source software. Mart Chief Operating Officer Myron Maurer has promised that the project would never be used to display ads. A curatorial board would be set up as early as this spring to select which works would be screened, including holiday-specific pieces and work from student art shows. First proposed in March of 2017 as a joint effort between the Mayor’s office and theMART, the project was envisioned as a “large-scale architectural projection” that would contribute to the ongoing revitalization of the Chicago waterfront. Vornado had reached out to New York City-based A+I Architects and San Francisco-based Obscura Digital to conduct the feasibility study and will be paying the $8 million installation cost and $500,000 yearly maintenance costs out of pocket. Obscura has worked on enormous projections and screen-related art projects at Grand Central Terminal, the Empire State Building, and at the Sydney Opera House. With the project moving forward, Mayor Emanuel is advancing an ordinance to the City Council that would allow for the installation of the 34 necessary projectors under a 30-year license. If the City Council approves, theMART’s light shows could begin by October of this year, and works would be projected for two hours a night, five days a week, for up to ten months a year. Art on theMART is the latest in a continuing transformation for the building, which has recently shifted from housing wholesale retailers and showrooms into a tech hub and office building. A video mockup of the installation is available here, courtesy of The Chicago Sun Times.